Buy it on accesshiphop.com and get a bonus mix CD! Los Angeles hip hop producer DJ Presto has corralled some impressive names for his second album. Set for release in the US on June 17 via his Concrete Grooves imprint (with Fat Beats distribution), State of the Art features guest appearances from Fatlip, CL Smooth, Blu, Rashaan Ahmad, Kim Hill, Trek Life and frequent collaborator LOWD. The first single, "Conquer Mentally," features Sadat X, Large Professor and O.C. 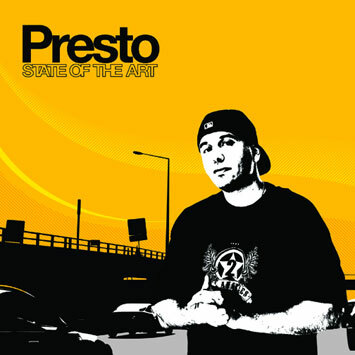 Throughout the decade, Presto has quietly produced choice breaks with downbeat sensibilities that recall the best of the 90s Jazzy Fat Grooves era. While previous recordings focused on his instrumental talents, State of the Art is almost solely dedicated to vocal collaborations, perhaps in a gambit to draw listeners that sleep on instrumental hip hop.